Team TPG has gotten together to come up with our favorite amenity kits while in business and first class. Today, TPG Associate Editor Emily McNutt breaks down what the team came up with as our favorite amenity kits and what makes each of them worthy of a spot on this list. One of the great perks about flying business or first class is the amenity kit that comes with the trip. Each carrier has the opportunity to set themselves apart from the rest with the design and contents of each kit. From international to domestic legacy carriers, most airlines offer both first- and business-class kits, many of which are co-branded with luxury designers and skincare product companies. When flying, it’s hard to beat being handed an amenity kit that comes equipped with goodies to keep you relaxed and refreshed for the duration of your flight — and it’s an added bonus when the there are additional features to the essentials like dental kits and tissues. We here at TPG have done a lot of flying in business- and first-class cabins on carriers of all kinds, so we decided to compile a list of our favorites. From Bvlgari skincare products to Rimowa hard-shell bags, it’s always interesting to see how airlines come up with new designs and partnerships to avoid blending in with the rest. Here are our most memorable and favorite amenity kits in the sky. ANA’s first-class amenity kit reminds you that you’re on a plane — in the best way possible. 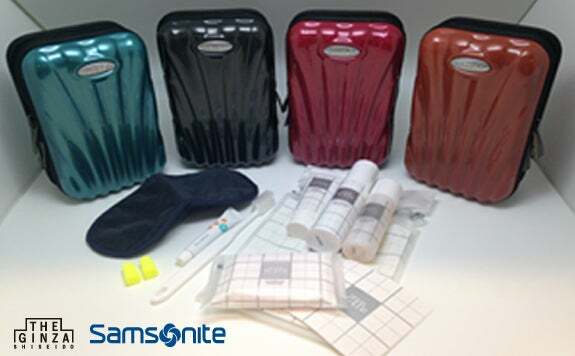 It comes packaged in a miniature Samsonite hard case, which is offered in four different colors, each with the same features to make sure you’re relaxed for the entirety of your flight. Inside, you’ll find a Ginza Cosmetics basic care set, including energizing lotion, moisturizing emulsion, creamy cleansing foam and four facial cotton pads. You’ll also get the standard dental kit, eye mask and ear plugs. Image courtesy of Cathay Pacific. Cathay’s first-class amenity kit looks incredibly appealing. It offers both male and female versions of the product — with the former coming in a grey case and the latter in a camel color. 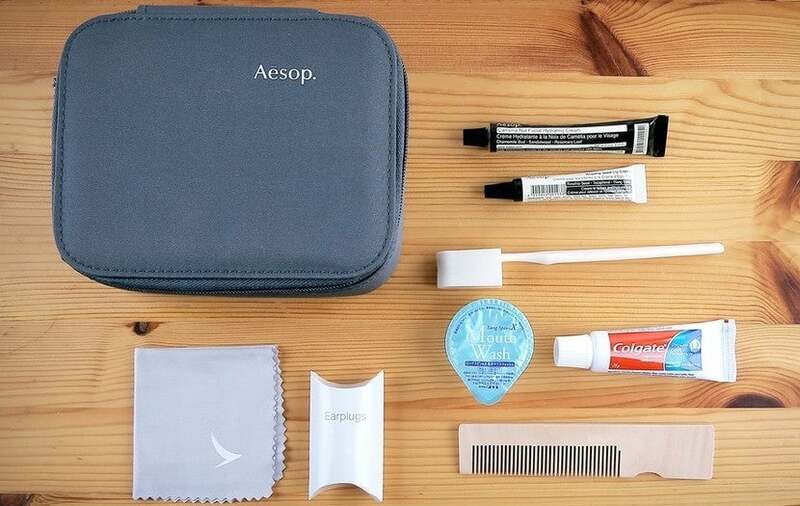 They are pretty standard and feature all the essentials of a first-class amenity kit, but the added bonus is the stackable feature with the Aesop bags that allows passengers to stack multiple bags on top of one another with the zipper. Inside, the Aesop products, such as Aesop camellia nut facial hydrating cream and Aesop rosehip seed lip cream, complement the extremely comfortable organic cotton pajamas and super plush eye mask that TPG Editor-in-Chief Zach Honig loved on his flight from New York-Hong Kong. 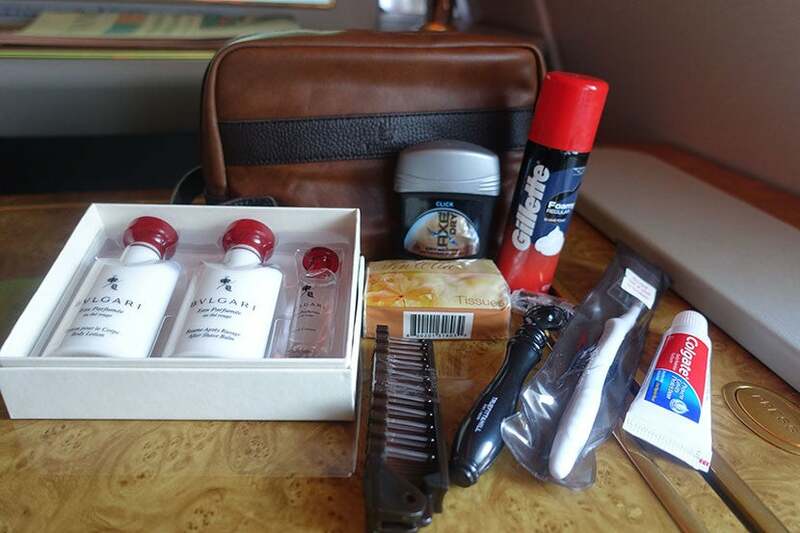 We love what Emirates is doing with its first-class amenity kit. 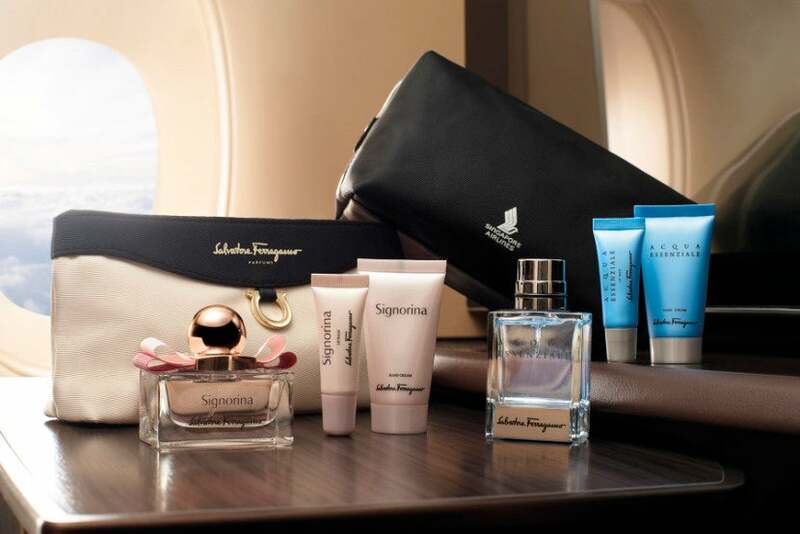 In October 2015, the airline announced that it had launched a new set of amenity kits for both first- and business-class passengers, all designed with luxury Italian brand Bvlgari. First-class amenity kits will have eight designs — four leather bags for men and and four satin bags for women — each one unique in its own way, and the airline will refresh the designs every nine months to give travelers something new to look forward to. When TPG himself flew from Milan to New York, he was thoroughly impressed with the Emirates first-class amenity kit and claimed it was one of the nicest kits in the sky. Each set comes with a foldable hairbrush, Bvlgari red tea body lotion, red tea nourishing face emulsion (for women), red tea after shave balm (for men) and sample Bvlgari spray, among the other basics like dental kit, brush and tissues. The Etihad first-class amenity kit is more traditional than its business-class counterpart. The bag is designed by UAE-based Sougha. Its design is inspired by the heritage and history of the Emirati people and highlights the centuries-old Abu Dhabi weaving craft known as Sadou, which features bright colors and unique designs. Inside the pouch, first-class passengers will find products from Le Labo, a fragrance brand based in New York. You can pamper yourself with the fresh scents of Le Labo’s Bergamote 22 line with hand and face moisturizers, lip balm and a refreshing towelette. 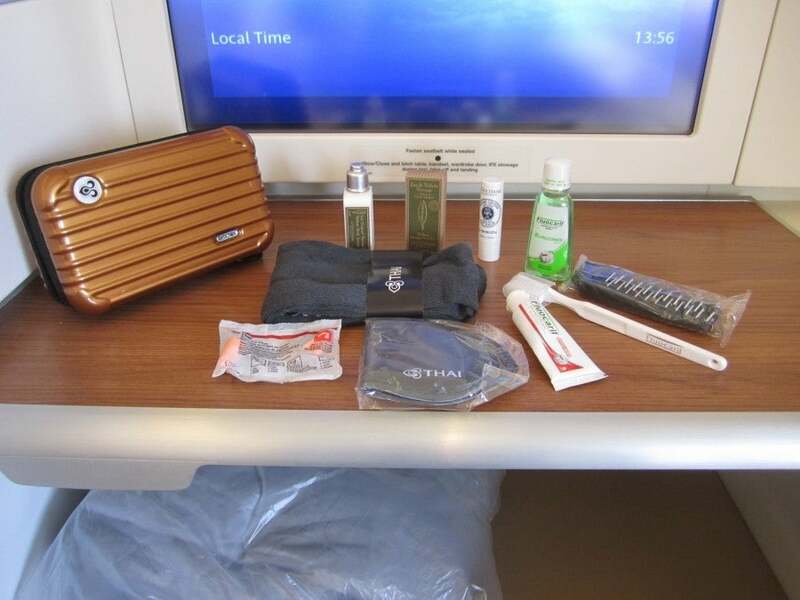 Etihad’s first-class kit also comes with the standard dental kit, socks, eyeshade, earplugs, as well as unique additions like mints, pillow mist and pulse point oil. Lufthansa’s first-class amenity kit is great — especially because of the La Prairie products inside, which TPG Special Contributor Eric Rosen especially enjoyed on his flight. As of this year, first-class passengers once again receive a hardshell Rimowa amenity kit. Inside, there’s a selection of Swiss-based La Prairie products, including small tubes of eye cream, hand cream and lip balm, as well as an Evian facial mister. There are also the typical amenity kit goodies like a dental kit, eye mask and earplugs, as well as a shoe horn and brush. Image courtesy of Singapore Airlines. Singapore Airlines’ first-class amenity kit product is known not only for its contents, but also for its sleek packaging. The Ferragamo bags are elegantly designed and worth keeping well after you deplane — a black and white clutch for women and a black bag for men. But it’s not only on the exterior of the bag that makes this unique, but also what’s inside that make give this kit a spot on our list. The kits are filled with Ferragamo products — Signorina eau de toilette, moisturizer and lip balm for women and ACQUA Essenziale cologne, moisturizer and lip balm for men — which explains why TPG himself talks about the kit with such high regards. Not to mention, Singapore’s First Class Suites product is also one of the best products in the sky. Image courtesy of Eric Rosen. Thai Airways’ first-class amenity kit for those flying in its Royal First Class comes in a Rimowa hard-case bag that is extremely functional and well worth keeping long after you deplane. Inside, there are skincare products from L’Occitane, including hand cream and lip balm, as well as a lemon verbena eau de toilette. There are also the basic amenity features like a dental kit, earplugs, eye mask and a brush. Although the products inside are nice, the highlight is really the Rimowa hard-case bag that is nice for both on board and useful long after you get off the plane. Image courtesy of American Airlines. 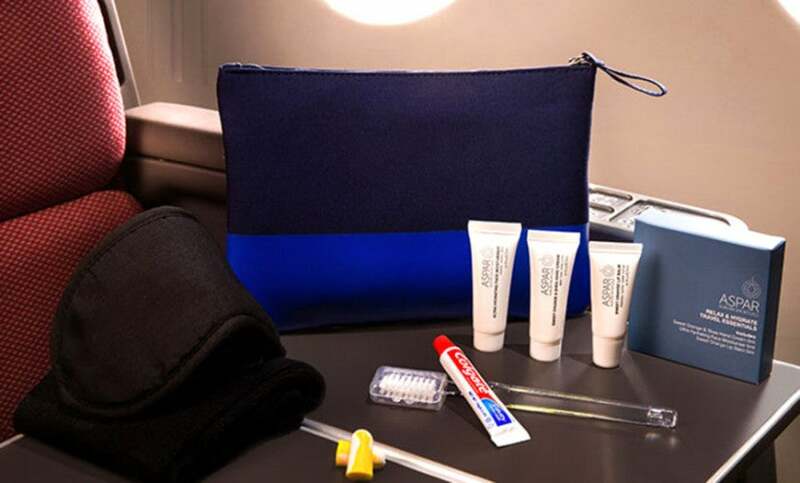 Just last month, American introduced its latest amenity kit — a snazzy Cole Haan-designed bag with various brands of skincare products inside — which will be available on AA flights in March. American offers three different varieties of its amenity kit, with the international business-class version containing American-made C.O. Bigelow Apothecaries products, including lip balm, lime and coriander body lotion and mouth wash, as well as tissues, a pen and foam headphone covers. The bags are a Cole Haan Dopp Kit design and come in eight different color combinations. Passengers will also receive a discount code for 20% off C.O. Bigelow products, as well as $75 toward a future Cole Haan purchase. Although American’s old business-class amenity kit was on this list — retro-themed kits that bore the colors of the different brands that make up the present day AA, including familiar names like US Airways, TWA, America West and Allegheny, among others — this new kit appears to be a step up. Delta launched its new Tumi bag for Delta One passengers in July 2015 with two products: a soft case bag and a hard case. Which one you’ll get depends on the direction you’re flying — so if you’re flying on a round-trip transcon, you’ll get both. Inside, passengers will get a Tumi-branded eye mask and skincare products from New York’s Malin+Goetz, including body lotion and lip balm. The kits also come with the standard amenity kit fare — a dental kit, earplugs, tissues and socks. Emirates’ business-class amenity kits underwent an overhaul last year. The bags for the new product come in eight designs for men and women, and they are designed by Italian luxury brand Bvlgari. The amenity kits are available on long-haul night flights and all flights over 10 hours, and they will be refreshed every nine months so those who fly Emirates business class often will have something new to look forward to. The men’s bags have a buffalo leather trim and there are satin kits available for women. Each contains a foldable hairbrush, basic dental kit, tissue pack and a razor and shaving cream for men, as well as Bvlgari red tea body lotion, red tea spray, red tea nourishing face emulsion (for women) and after shave balm (for men), as well as a Bvlgari oshibori towel for women. Both Etihad’s first- and business-class amenity kits are worth noting. 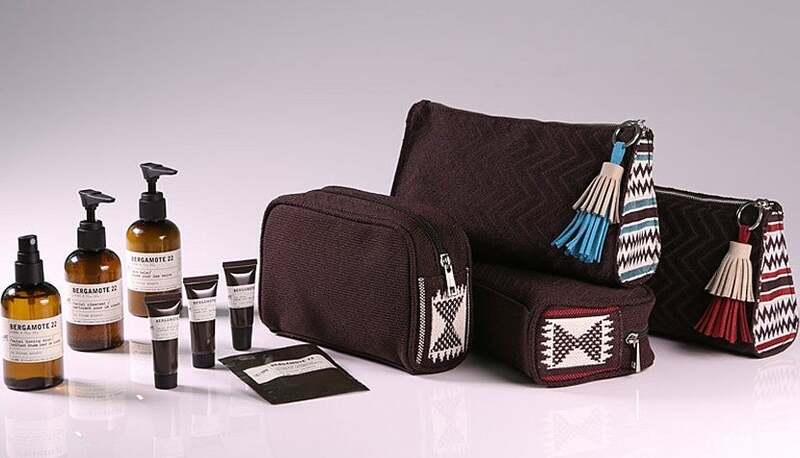 Etihad launched this limited edition business-class amenity kit in October. The six colorful products are the result of a collaboration with LUXE City Guides to represent six cities (Abu Dhabi, London, Madrid, Los Angeles, Sydney and Hong Kong) and the contemporary and innovative flair that is synonymous with the Etihad brand. 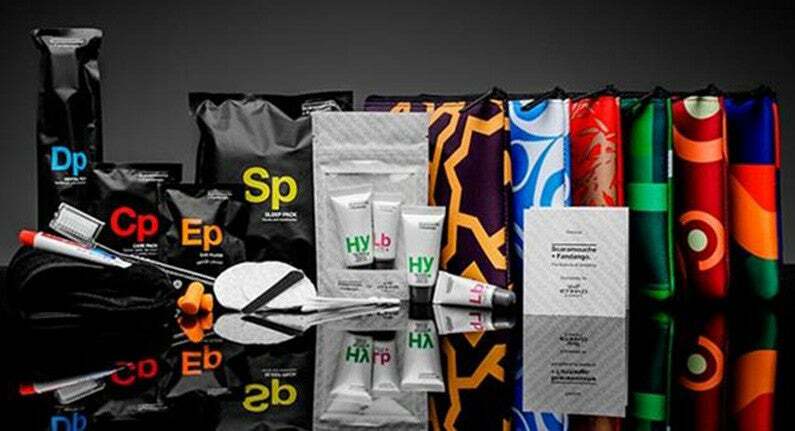 Inside, there are the basic amenity kit products including a dental kit, socks and eye mask, as well as natural facial products developed by London-based skincare brand Scaramouche + Fandango. What also makes Etihad’s business-class amenity kit so unique is the customized city guide inside that corresponds to the showcased city on the bag and covers everything from hotels and restaurants to spas, bars, boutiques and more. Image courtesy of EVA Air. EVA Air’s Royal Laurel class amenity kit is both visually appealing and a nice touch when flying long routes. The carrier offers Royal Laurel passengers one of two shades of green Rimowa hard cases as the bag for the amenity kit — a refreshing lime green for outbound flights and an earthy olive green for return flights. The bag is both durable and a nice keepsake for travelers. Inside it, you’ll find products from Harnn, Thailand’s leading spa product brand — including sandalwood-scented moisturizer and lip balm. EVA Air’s product makes for a comfortable sleep on your flight with earplugs, an eye mask and basic dental kit. Image courtesy of Korean Air. Korean Air’s Prestige Class offers passengers traveling on lengthy flights to America, Europe, Oceania and the Middle East a refreshing kit. 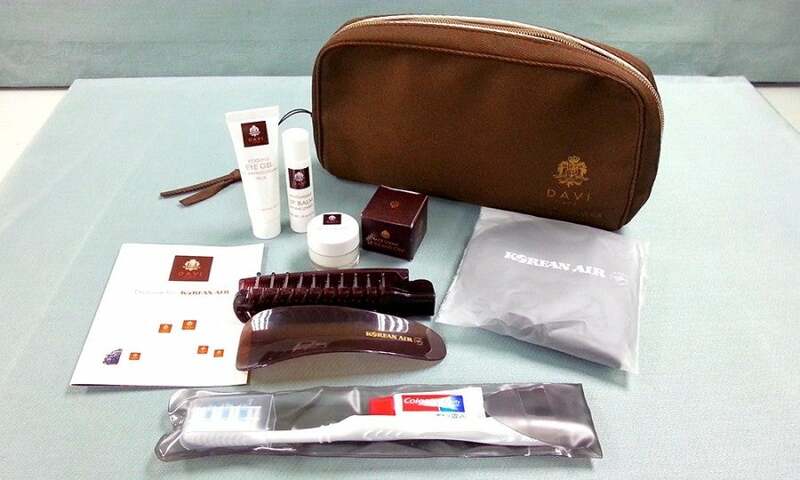 On the carrier’s spacious Prestige Class product, passengers are given a brown DAVI amenity kit bag. Inside the bag, the DAVI items continue to flow — cosmetic face cream, hand cream, aftershave lotion, eye gel and lip balm with added extracts of wine. Of course, you’ll also get the staples of a classic amenity kit with toothbrush and toothpaste and a brush. 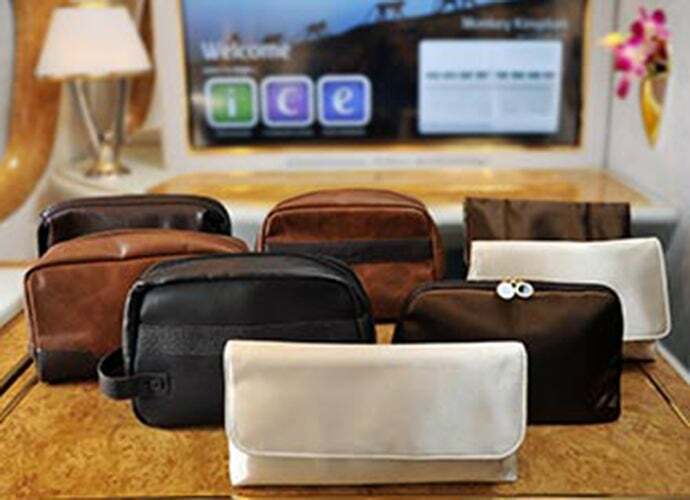 The Australia-based carrier offers unique amenity kits for business-class passengers on international flights. For the designer-brand enthusiasts, Qantas offers Kate Spade-designed bags for women and Jack Spade-designed bags for men. All bags contain Australian-made ASPAR (Aurora Spa Rituals) products, including sweet orange and shea hand cream, vanilla and orange lip moisturizer and an ultra-hydrating face moisturizer. Peter Morrissey-designed pajamas are available on select flights, and Malin+Goetz hand wash and cleanser are featured in the business-class bathroom. If you’re flying business or first class any time soon, there’s a lot to look forward to — from the service to the perks, and what will arguably keep you the most relaxed and refreshed for the duration of your flight, the amenity kit. Team TPG has compiled a list of our favorite business- and first-class amenity kits for you to look out for — or plan your trip around — the next time you fly. What’s your favorite business- or first-class amenity kit?